Minimalist music is a long circular, repetitive and hypnotic pulsation that continued to evolve throughout the 20th Century together with human progress, technological advances and historic disasters. From the Second Viennese School’s twelve-tone music to minimal German electro, from Charlie Parker and Dizzy Gillespie’s bebop to the ambient of Brian Eno, the ramifications are numerous and unfathomable. However, it was in fifties and sixties America that this musical form found its most passionate creators and reached its peak. Among others, John Cage, La Monte Young, Steve Reich, Terry Riley and Philip Glass each broke the boundaries of musical abstraction in their own way. They composed works aimed at changing and disturbing our sensory perception: prolonged sounds on the same chord, arrangements with harmonies superimposed at different speeds, insistent repetitions and gradual changes. Temporal frameworks and structures lay abandoned in favour of sonic progressions which could last for more than an hour. For Brian Eno, minimalism is a « drift away from narrative towards landscape »; the music of avant-garde composers is inseparable from the American obsession for emptiness and wide open spaces, and being able to live among such scenery. The rhythmic pulsations of minimalism would also be imbued with the frequencies of the urban frenzy found in American megacities with horizontal gigantism (Los Angeles) and vertical gigantism (New York). Thus, the expressive power of these works immerses us in the tranquillity of enchanting, wide-open nature as well as the gridlocked, narrow buzz of city machines and upheavals. John Cage would set change in motion by stating in 1952 that: « Beethoven had misled generations of composers by encouraging them to create climax-oriented harmonic structures », the manifesto of a music free of all restrictive traditions, in line with the changes to artistic forms seen in the 20th Century, with abstraction as its guiding compass. In the late 1940s, John Cage visited a room at Harvard University designed to absorb all sound without leaving an echo. While he was hoping to hear nothing at all, he could in fact make out a high-pitched sound: according to the engineer present, it was his nervous system and blood circulating. A few years later, John Cage composed a work of uninterrupted silence lasting exactly 4’33 ». The score is structured in three movements, each with the same instruction for the pianist: Tacet (« Silence » in Latin). At the first performance of 4’33 at Maverick Concert Hall in Woodstock by David Tudor, the audience heard only the noise of the piano lid being opened and shut between movements. John Cage wanted to demonstrate in a radical way that silence is actually a real note; it just means all sounds not wanted by the composer when a piece is being performed. Minimalist music creates an atmosphere which intensifies sensations by upsetting our mental and temporal space. Its captivating character results in highly visual expression. After a few incursions into experimental cinema (with compositions by La Monte Young for the films of Andy Warhol and by Steve Reich for The Plastic Haircut), minimalist music was soon no longer the preserve of modern art galleries and concert halls. In writing a great deal of film music, Philip Glass achieved popularity levels rarely seen among modernist avant-garde musicians. His circular, repetitive and gradually evolving compositions work naturally with the images of filmmakers. Throughout his career, he racked up collaborations with independent films and the biggest Hollywood productions: The Truman Show by Peter Weir, Kundun by Martin Scorsese, The Hours by Stephen Daldry, Fantastic Four by Josh Trank. 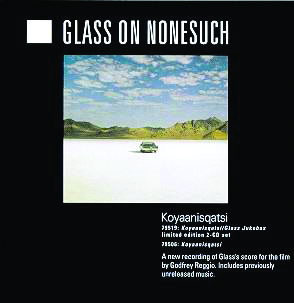 He wrote his first film score for an experimental documentary produced by Francis Ford Coppola: Koyaanisqatsi by Godfrey Reggio in 1982. A poetic, hypnotic and non-narrative work, the film features images showing the evolution of our planet through contact with technological advances in a series of different-speed shots. However, the filmmaker is neither accusatory nor moralistic. He simply wishes to show « the beauty of the beast ». The bareness and fixedness of minimalist music create a shiver each time even the smallest of rhythm or chord changes occurs. Horror filmmakers naturally find that the soundscape reinforces the fear and suspense they seek to create. In 1992, Philip Glass composed the score for horror film Candyman (Bernard Rose), which took the best film score prize at the Avoriaz Festival the following year. For a long time unavailable, this soundtrack (including the Music Box theme) would become one of the composer’s best-known works. A few years later, he worked with the Kronos Quartet on an original score for the release of the film Dracula produced in 1931 by Tod Browning with Bela Lugosi). One artist would, in a more intuitive and less « carefully planned » way, leave his own permanent mark on horror film music: American producer and composer John Carpenter. He used the potential of pure, repetitive motifs found in minimalist music for his own films and composed some of the most terrifying scores ever written. In 1978, John Carpenter and his producer Debra Hill were feeling distressed, but sadly not by the film they had just finished: Halloween, Night of Masks. They no longer had the budget to ask a composer to write the music and were desperate to find a symbolic theme which would match their film’s underlying terror. Indeed, all shots in Halloween are rife with the presence of killer Michael Myers, whether or not he is visible on screen. The filmmaker’s job was to play off the ghostly presence symbolising absolute evil; that is, an evil presence lacking any reason for acting as it does and not created by anyone. As in most of Carpenter’s films, « it’s not about knowing if something is going to happen, but when it’s going to happen », leaving the viewer in a state of permanent distress. So, he had to find music which would fill these times which appeared « empty »: when the boogeyman seemed to have left. The director then remembered a 5/4 rhythm played on bongo drums by his father when he was a child. He reproduced it on the piano, adding in a few effects. This simple, pure, cyclical and repetitive composition became the symbolic horror film music theme. Four years later, after the success of Halloween, John Carpenter made his first film for a large studio. He was able to give the job of film score composition for The Thing to one of the most iconic cinema composers: Ennio Morricone. However, the Italian maestro was known for composing dense, orchestral music: a long way from Carpenter’s pared back themes. As in his previous films, the monster who, this time, would infiltrate an isolated research community in the middle of the Antarctic, is almost always off-screen. The music therefore has a sonic role as well as a visual one; it is a key element in organically creating fear. John Carpenter met Ennio Morricone at his Rome studio and, as expected, the American director found there were far too many notes for his liking. Carpenter asked him to remove some of the layers and keep only the bare minimum. The collaboration between the two composers would result in the most minimal theme in any John Carpenter film, and perhaps in the history of cinema as it would have only…two notes. As « nothing is lost, merely transformed », the original scores Ennio Morricone composed for The Thing would end up being used in the film The Hateful Eight by Quentin Tarantino: another excellent snow-filled film. The sound and visual universe that John Carpenter created throughout his career would leave a permanent mark on many composers and directors. The dry, pervasive themes composed for his first film, Assault, are today used as a musical handbook for an entire generation of electro producers. Many filmmakers are strongly influenced by the obsessive universe created by Carpenter when making their own films. In particular, the film Drive by Nicolas Winding Refn, which pays homage to the film Christine. The film It Follows made in 2014 by director David Robert Mitchell is a skilfully executed indie mish-mash which would take its aesthetic influences from the masters of genre cinema: De Palma, Cronenberg, Tourneur and, mostly, John Carpenter. This can be seen from the score, composed for the film by the young American producer Disasterpeace, whose main theme is based on a piano motif openly reminiscent of Halloween’s. it has made abundant use of new formal and rhythmic liberties taken by avant-garde composers since the end of the Second World War. However, what would significantly broaden the creative horizons of these two musical currents was the frenzied progress of technology and increased numbers of machines which shook up all artistic disciplines throughout the 20th Century. This situationist manifesto written in 1958 would be ultimately fulfilled twenty years later via a graphic German music group from Düsseldorf: Kraftwerk. In 1978, the group brought out an album with the programmatic title Die Mensch-Machine (The Man-Machine) at the start of which they proclaimed: « We are the robots ». After several albums paying homage to a living made from technology, here the group created a fusion between human and machine elements towards which it had been edging since it was founded. Inspired by the electro-acoustic research and sonic spatialisation of Karlheinz Stockhausen, the group would soon free themselves from Krautrock: experimental, cosmic rock developed at the start of the seventies as a kind of West German response to English and American pop. Kraftwerk chose an entirely different radical path. In particular, the group created music resolutely and completely free of English-speaking norms: « We are the first German group to record in our language, use an electronic background and create a central European identity […] We arrive at the basic structure of our music using the mechanical German language ». But what would establish the group’s uniqueness in the long-term was their cold, mechanical and repetitive music aiming to reveal the voice of technology and thereby enable us to hear the song sung by machines. The group’s first success was the track Autobahn: a piece from 1974 which was both symphonic and minimalist, immersing us for more than twenty minutes in the joys of driving along the motorway: « Wir fahr’n, fahr’n, fahr’n, Auf der Autobahn » (« We drive, drive, drive, down the motorway »). Then came the albums Radio-Activity (1975) and Trans-Europe Express (1977) which would lead the group towards compositions almost entirely recorded with electronic material. This would be the case for their next album. The album sleeve for The Man-Machine suggested the group’s progressive dehumanisation: black, slicked-back hair, identical shirts and ties, fixed stances and faces turned towards a radiant mechanical future. The graphic style is inspired by the Bauhaus movement and Russian constructivists. These Russians were socialists with a positive view of machines. This enthusiasm was, we know, strongly shared by Kraftwerk: « When machines are used in society, it often looks like man is fighting with his own invention: in our work, we stand as a counterpoint to this disastrous assessment » declared Ralf Hütter, orchestral conductor and quartet singer. The album The Man-Machine represents the group’s peak mastery of electronics. Its influence on music is considerable, and lead to the emergence of techno. Minimalist musicians have reacted against the formal demands imposed by the upheavals of the 20th Century. Their compositions have often been the continuation or advent of experiments developed in other artistic disciplines. Isn’t John Cage’s 4’33 an echo thirty years in the future, of White on White by suprematist painter Kazimir Malevich? The two works push « purity » as far as it will go, explicitly revealing the gradual erasing of the subject. Having measured himself against God and then against nature, man now compares himself to technology. Thus, repetitive rhythmic pulsations reflect less the beating of the human heart and more the binary mechanism of the machine. The radical experiments and immense freedom of avant-garde musicians have generated many musical currents whose common characteristic is this progressive, circular and regular beating.